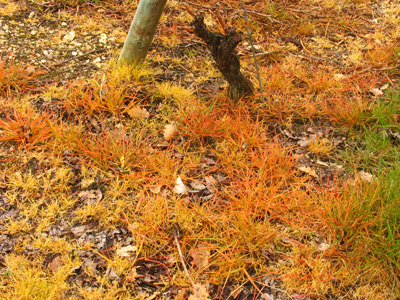 'Sur les quelque 20 000 ha que compte le vignoble angevin, il faudra désormais enherber ou travailler l’inter-rang. L’attente fut longue, même un peu incompréhensible tant la mesure semblait de bon sens dans l’ambiance environnementale du moment. Il a fallu quelque 18 mois pour que le Comité national de l’Inao valide, le 6 septembre dernier, les nouveaux cahiers des charges des 27 appellations d’Anjou-Saumur, qui introduisent l’interdiction du désherbage chimique total. Lire la suite – read the rest here. 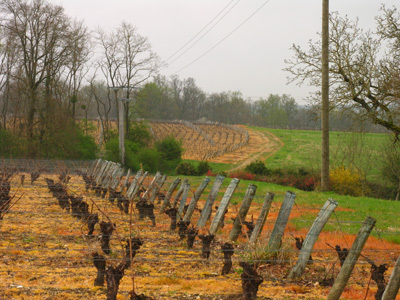 It has now been agreed by the French wine authorities (INAO) that the use of weedkiller in the vineyards of Anjou-Saumur will be severely restricted. Their use is banned between rows of vines and can only be used under the vines. The alternatives are grassing over, working soil – harrowing etc. or the use of organic weed suppressors. There now follows two months of consultations when opposition can be voiced. The ban is expected to come into force at the beginning of 2019. The use of weedkillers on the headlands/ extremities of a vineyard was already banned from 2008. This is a very welcome development. I hope we will see a similar measure being introduced in Touraine, where in the generic Touraine Appellation total blitzing of vineyards is still unfortunately all too widespread. 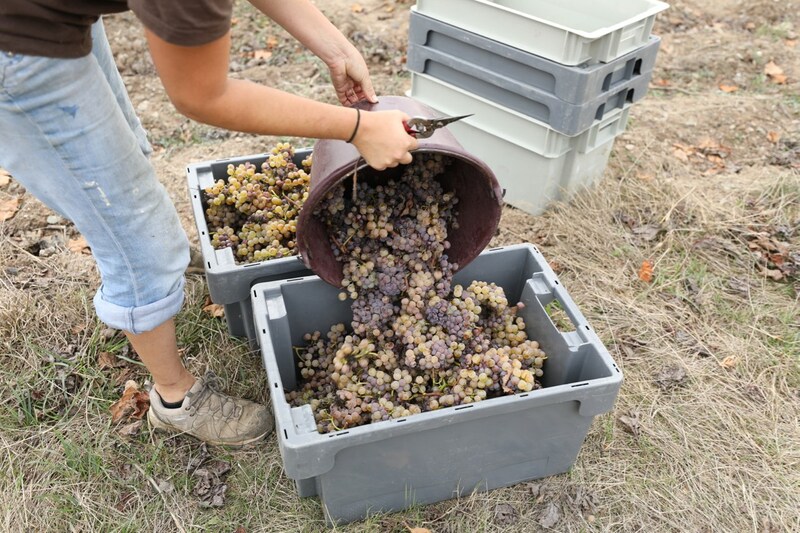 We spent last Wednesday and Thursday in Anjou on a quick visit to see how the harvest has been going here. Overall the message is much the same as in other parts of the Loire. 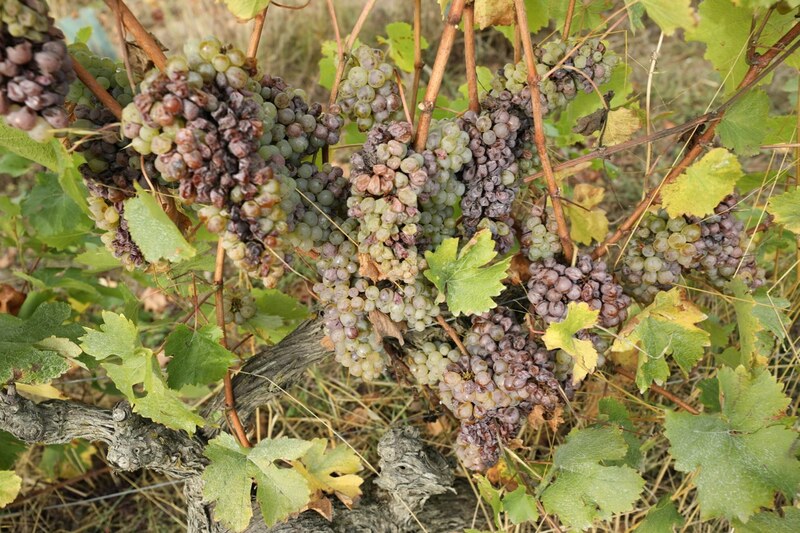 Several producers commented that they had never seen grapes like these before – giving both quality and quantity. 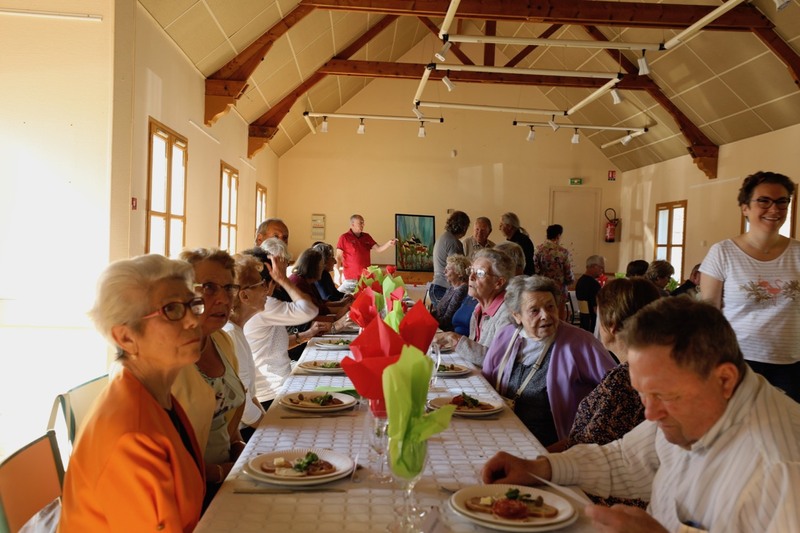 Of the producers we saw many started in early September – Damien Laureau (4th September and finishing by 10th September), sisters Anne and Marie Guégniard, Domaine de la Bergerie (6th September) and Vincent, Catherine and Emmanuel Ogereau also on 6th. I tasted juice/fermenting wine at all three domaines and I found them all clean and precise often with potential complexity depending on the particular parcel and age of vine. Visiting Claude and Réné Papin at late Wednesday afternoon, Claude was critical of producers who he thought had picked to early and suggested that many 2018 wines would be simple, fruit driven without complexity because the grapes had been picked before they were physiologically ripe. The counter argument to this is that picking started in early September to avoid alcohol degrees shooting up to ridiculous heights due to the very warm conditions. 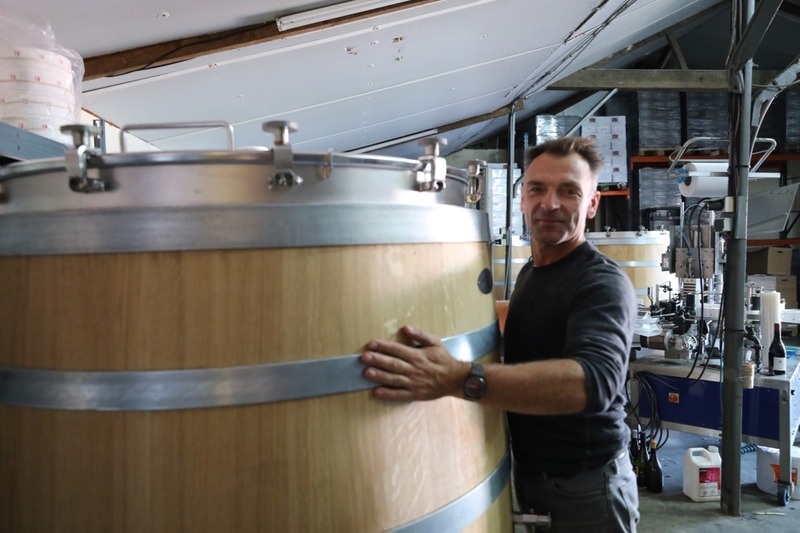 Some of Damien Laureau's cuvées are at 14.5% despite starting and finishing early. 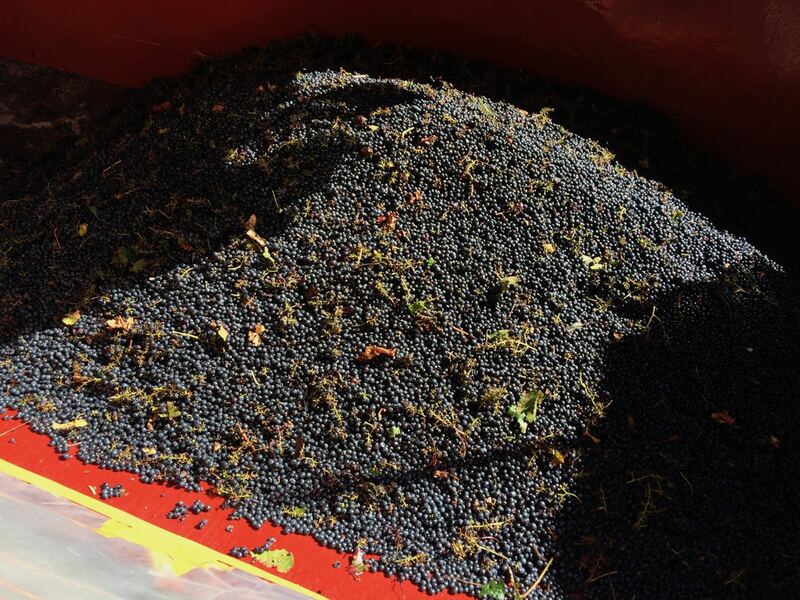 It will be exciting to taste these wines when they are finished. Perhaps we will be able to see who got it right....... may be! Once again the one sour note in 2018 is mildew with some very badly affected. We dropped in to see Eddy et Mylène Oosterlinck-Bracke(Domaine de Juchepie). Sadly they have been badly hit by mildew this year which has affected their morale as they have lost around two thirds of their crop. 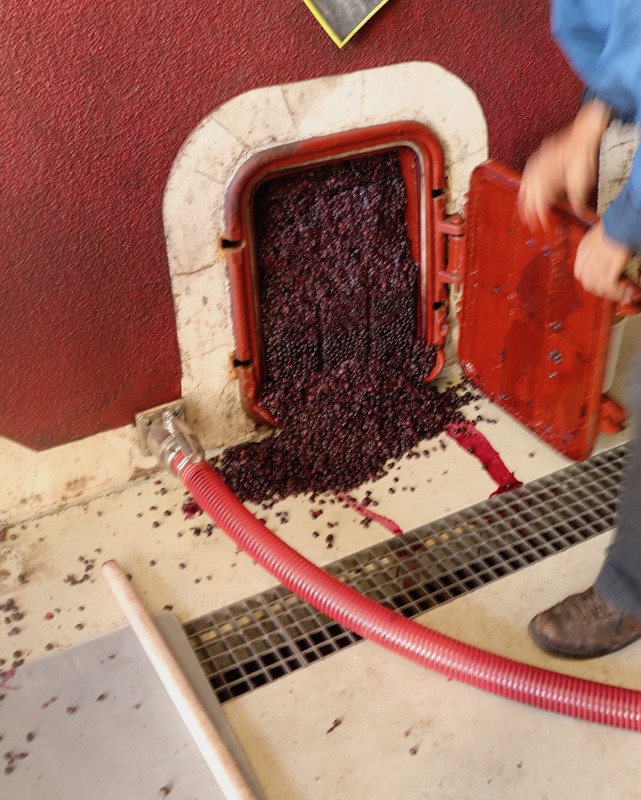 This means that instead of making a thrilling range of different sweet wines they will probably just make one. From the limited first pressing, however, it is already at 22% potential alcohol. Approved in November 2011 the appellation Quarts de Chaume (some 43 hectares) remains the only Grand Cru in the Loire and seems likely to remain the valley's solitary Grand Cru for some time to come. Its rules are strict and precise with clear indications of how these rules should be monitored. This is as it should be as Quarts de Chaume can be one of the world's great sweet wines. – weighing just 1.7 kilos in total? On Thursday morning I spent about an hour walking around the eastern part of the Quarts de Chaume appellation – the part to the east of the hamlet of Chaume. The previous afternoon I had spent a little time in the western part – unfortunately during one of the rare times during this harvest when it was raining. 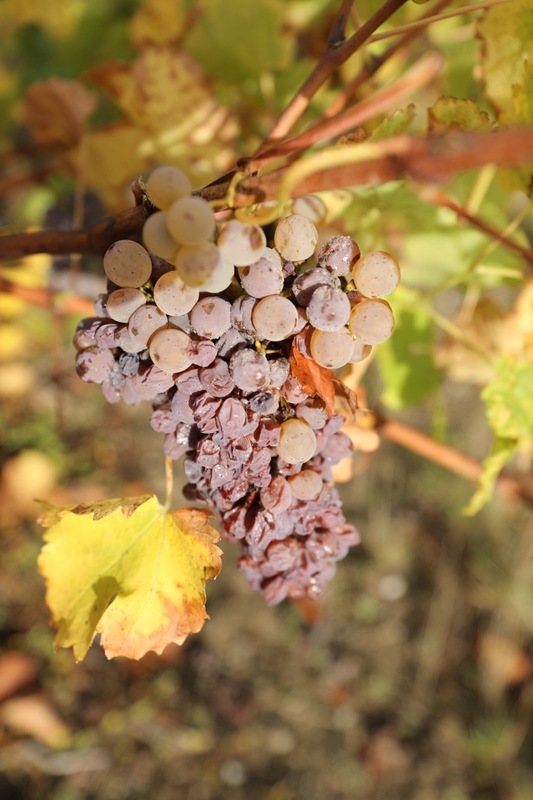 Here Baumard's vines had been picked – probably recently, so I cannot comment on their condition except that in his parcel on the plateau the grapes are often amongst the most advanced in terms of ripeness and incidence of botrytis. Whether the fact that these are vignes larges (low density vines) is a factor is an interesting question. 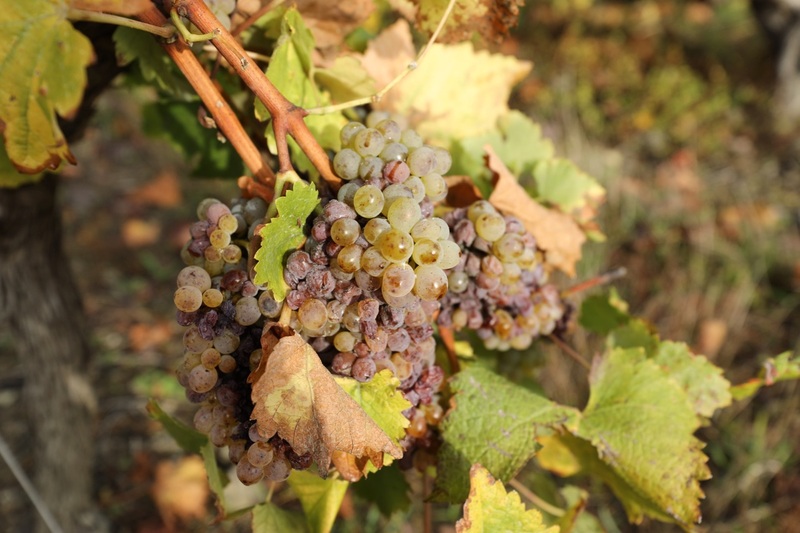 The fruit that I saw on Thursday morning were in variable states of ripeness – a characteristic of Chenin Blanc. 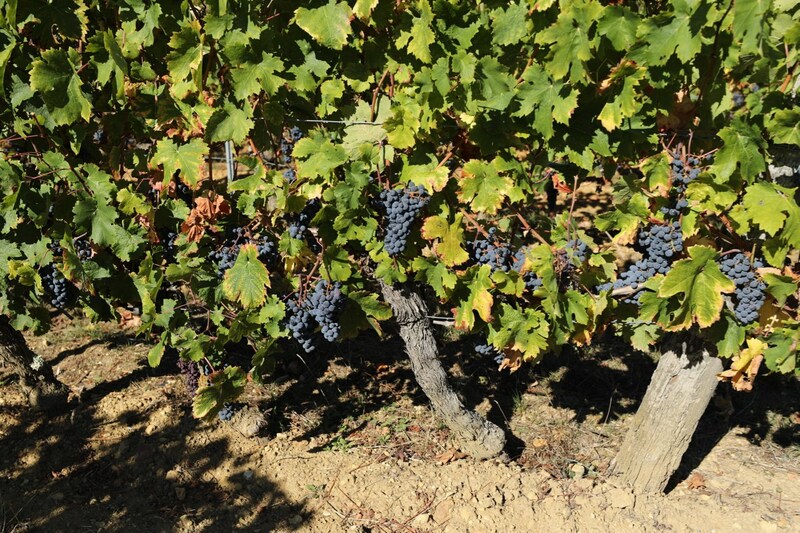 On the whole the vines had a limited crop with the notable exception of a parcel of vines immediately east of the Château Echarderie – see photos above. It may be that the owner of this parcel is not intending this year to make Quarts de Chaume Grand Cru from this parcel. 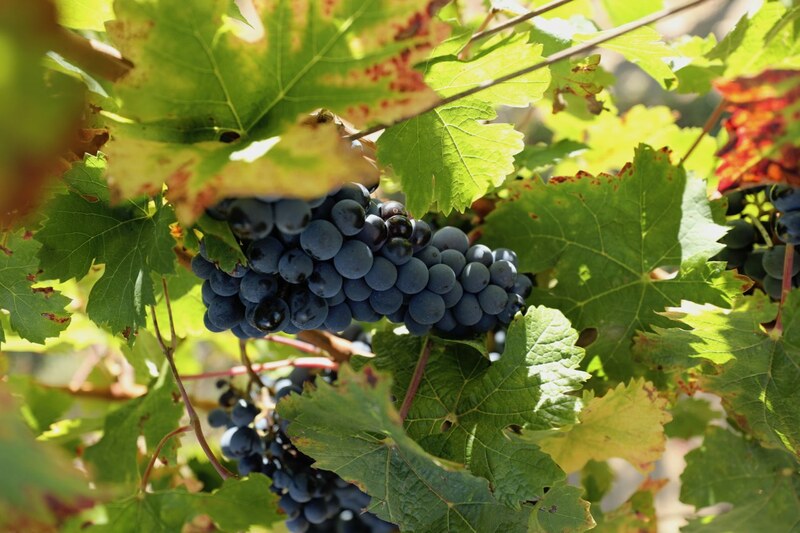 If so, this would be the correct decision, as unless these bunches are remarkably light, they appear likely to weigh considerably more than the maximum 1.7 kilos per vine allowed in the legislation of 22nd November 2011. It would, however, be a little strange if the owner of this parcel is not intending to make 2018 Quarts de Chaume from these vines as the price point for Quarts de Chaume is naturally higher than any other labelling options. 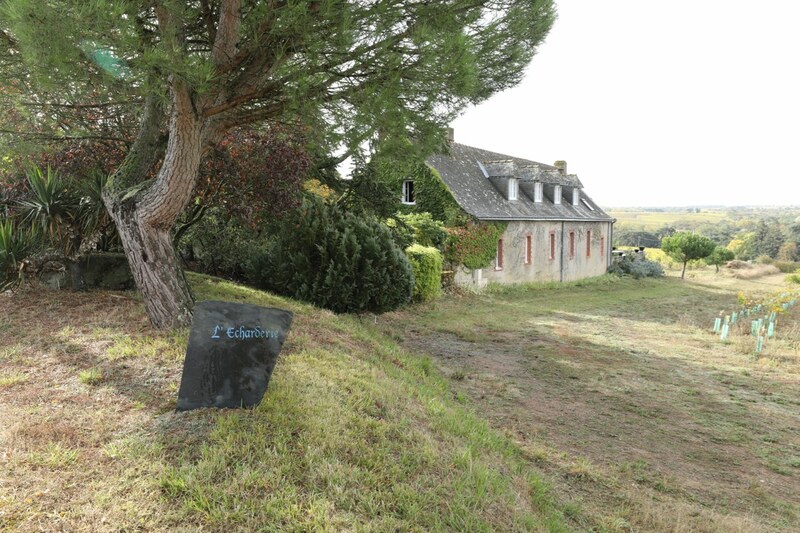 In which case, the 'control sur terrain' should have ruled this parcel ineligible for the appellation Quarts de Chaume Grand Cru until the crop had been reduced in line with the regulations. Given that this is a small prestigious appellation it should be easy to carry out the necessary checks and, if some parcels have an excessive crop, the rules (22.11.2011) make it clear that they should not benefit from Quarts de Chaume Grand Cru appellation. The particular over-loaded parcel was right by one of the main unmetalled tracks through the appellation and certainly not tucked away in a hard to find spot. 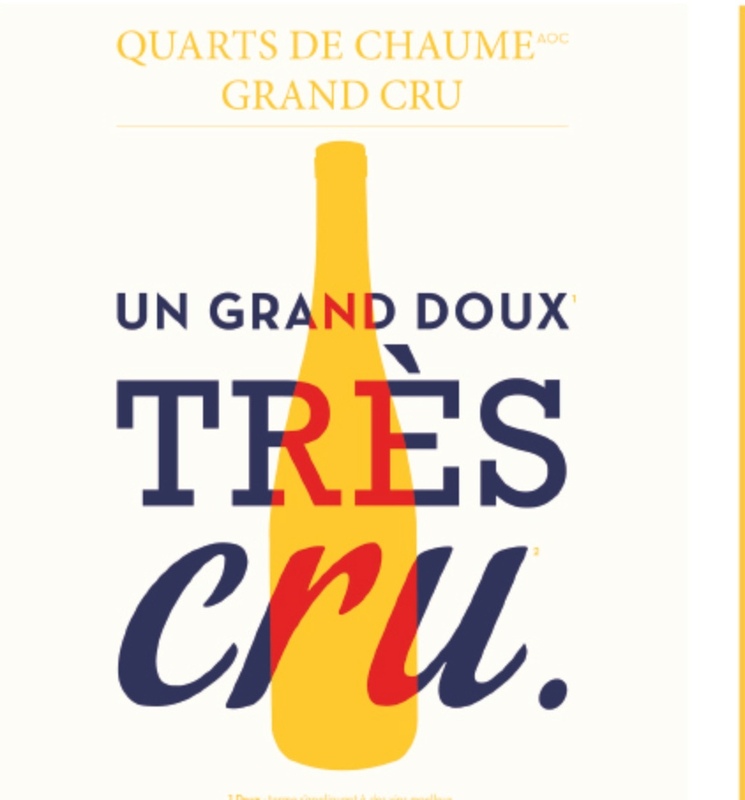 Quarts de Chaume Grand Cru is proudly promoted by the Loire as an exceptional wine. Claude Papin, president of the Quarts de Chaume producers, is rightly concerned that all bottles of Quarts to Chaume are up to standard. 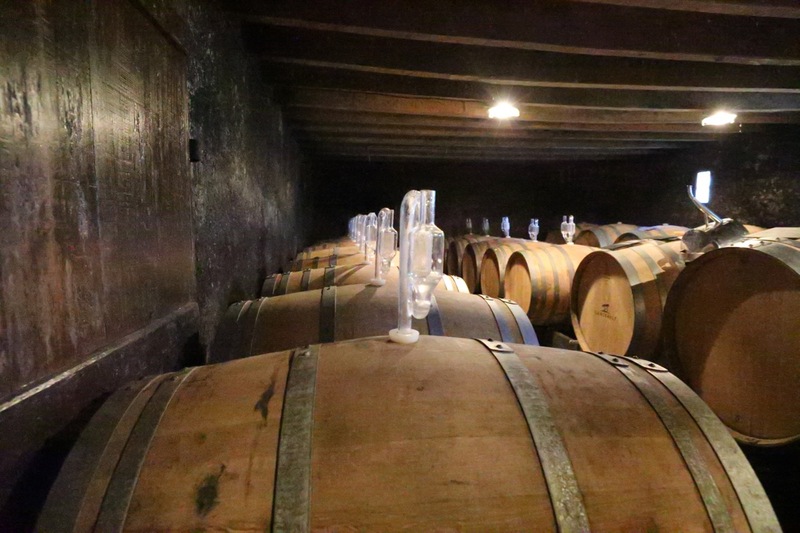 Wine buyers have the right to be assured that all growers in the Quarts de Chaume respect the rules and that the premium these wines can rightly command is justified. I made some similar points on Jim's Loire around this time last year on vines that had a noticeably low weight of crop. 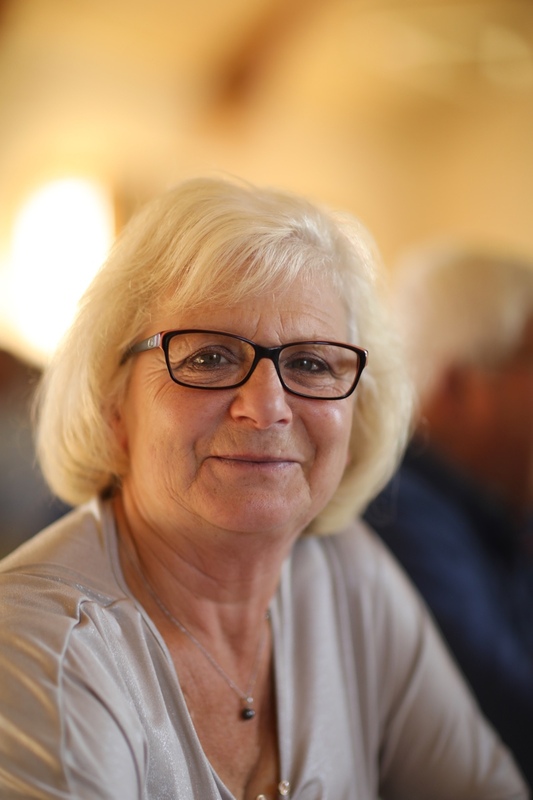 Nous avons le plaisir de vous annoncer que le Val de Loire accueille le 1st Chenin blanc International Congress à Angers, les 1,2 et 3 juillet 2019. 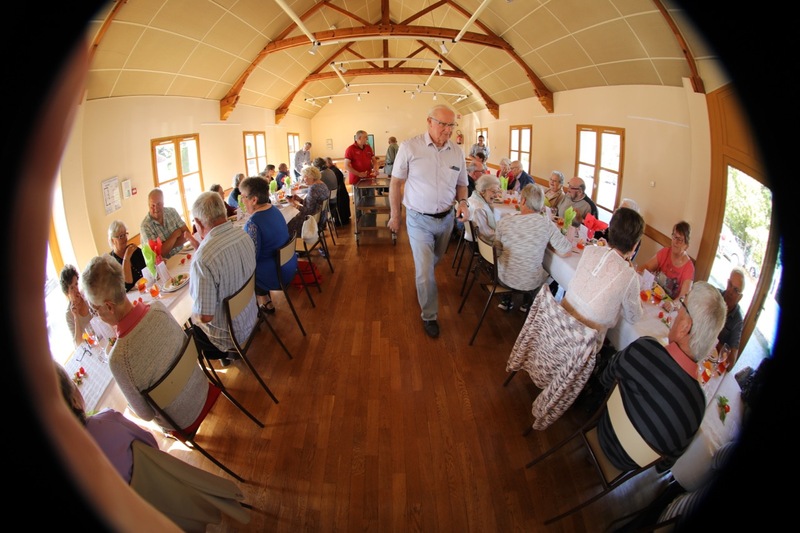 Cette première édition est co-organisée par l’Académie du Chenin et Destination Angers en partenariat avec Interloire, la Fédération Viticole d’Anjou Saumur, la Fédération des Associations Viticoles d’Indre et Loire et de la Sarthe, l’Université de Stellenbosh et la South African Chenin Blanc Association. Ce congrès destiné aux professionnels du monde viticole, s’inscrit dans la continuité des colloques de 1996 sur les Terroirs viticoles ( INRA Angers), de 2003 sur les Paysages de vignes et de vins ( Union des Œnologues de France/INRA Abbaye Royale de Fontevraud), des trois éditions de 2002, 2003, 2004 des Rendez-vous du chenin ( Union des œnologues de France) et de la journée d’étude : Chenin de 2015 ( Musée de la Vigne et du vin, St Lambert du Lattay). 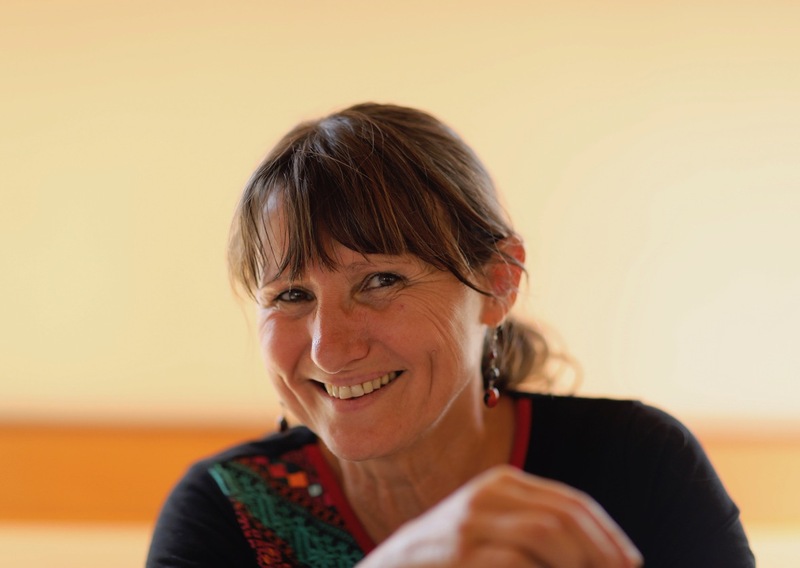 De dimension internationale, il est un lieu de rencontres et de débats sur l’avenir du Chenin blanc face aux défis de la viticulture mondiale, défis environnementaux, climatiques, économiques, sociétaux et culturels du XXI° siècle. Le comité scientifique prépare un programme exceptionnel, conforme à notre engagement d’excellence face à l’innovation, l’expertise et la créativité du monde viticole. Ce congrès international met en avant le cépage Chenin blanc, sa versatilité, sa singularité et ses terroirs. 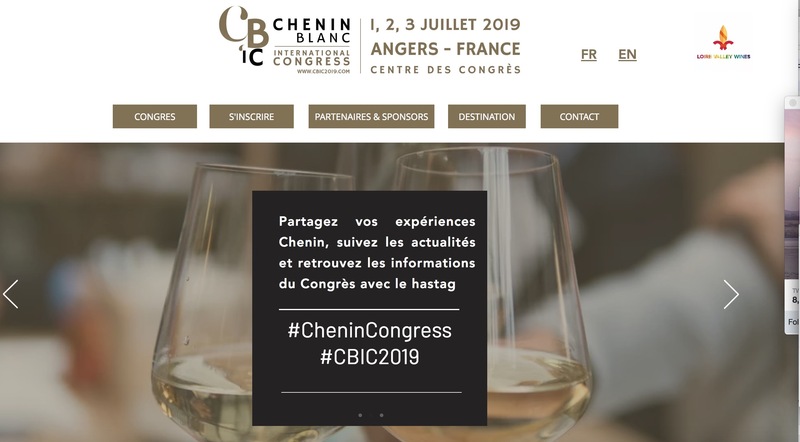 It is with great pleasure that we announce that the Loire Valley will host the 1st International Chenin Blanc Congress in Angers, on July 1, 2 and 3, 2019. This first edition is co-organised by the Académie du Chenin and Destination Angers in partnership with Interloire, the Fédération Viticole d’Anjou Saumur, the Fédération des Associations Viticoles d’Indre et Loire et de la Sarthe, the University of Stellenbosch, South Africa and the South African Chenin Blanc Association. 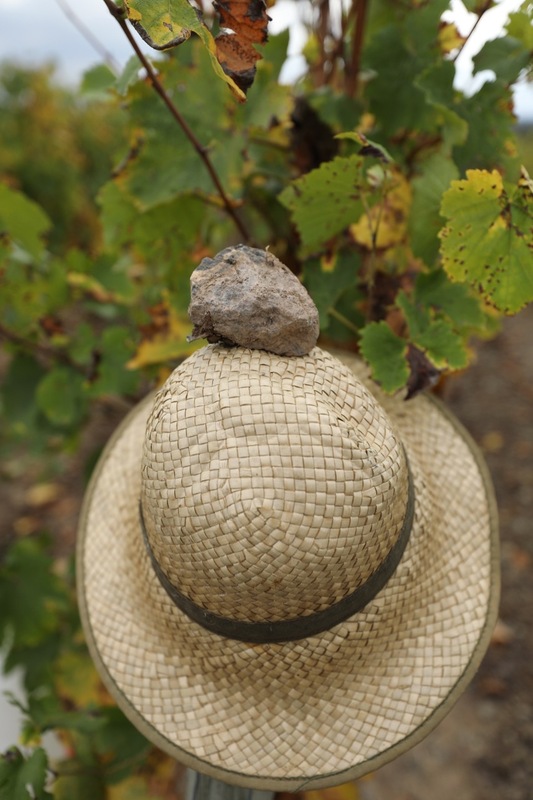 This congress aimed for the Wine industry is in keeping with the different symposiums on Chenin blanc, Terroirs and Landscapes organized from 1996 to 2004 (Royal Abbey of Fontevraud) as well as the 2015 Chenin Study Day (Museum of Vine and Wine, St Lambert du Lattay). With an international scope, this congress is a place to meet and debate about the future of Chenin Blanc faced with the challenges of global viticulture, i.e. the environmental, climatic, economic, societal and cultural challenges of the 21st Century. The Scientific Committee is preparing an exceptional program, in keeping with our commitment to excellence with respect to innovation, expertise and creativity of the wine trade. This international congress showcases the Chenin Blanc grape varietal, its versatility, its uniqueness and its terroirs. 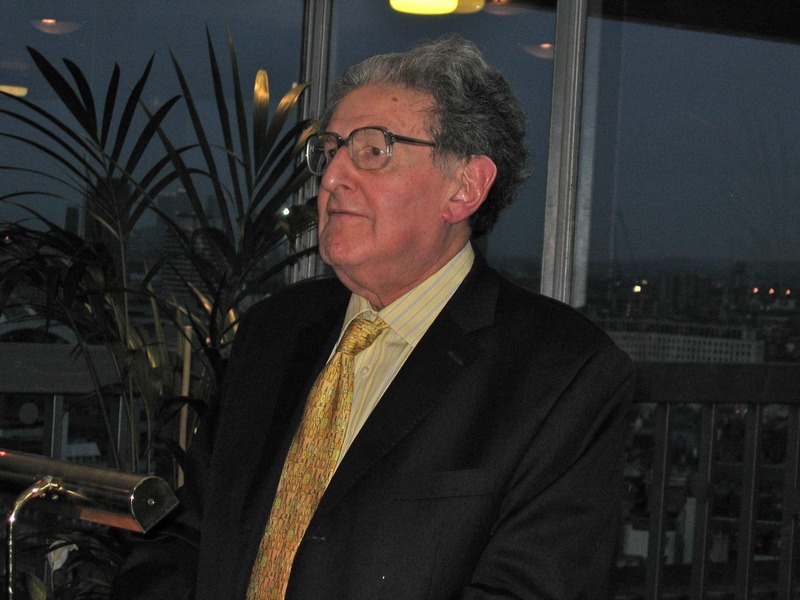 The eminent journalist and writer, Nick Faith, died on Wednesday 26th September at the age of 85. He was born in London on 6th July 1933. 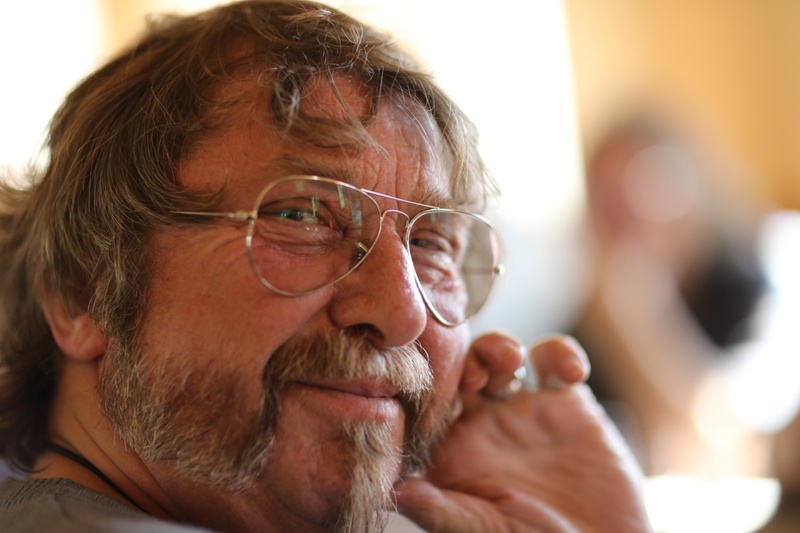 I was privileged to get to know Nick when he joined the Circle of Wine Writers around 1996. He was a great support for me when editing Circle Update, the newsletter of the Circle of Wine Writers. For a number of years he checked the newsletter for libel. Nick was a leading authority on Cognac as well as writing detailed and impressive accounts of the Cruse scandal in Bordeaux in The Winemasters (1978), which won him an André Simon Drinks Book Award, and The Bronfmans: The Rise and Fall of the House of Seagram on the once powerful Canadian drinks family. Railways were another of his passions and interests. Nick will be sadly missed. Last Thursday we made a quick dash through Saumur-Champigny to see how the 2018 vintage is progressing before heading off for an excellent lunch at Vincent le Cuisinier de Campagne , Ingrandes de Touraine. We had time to drop in on three producers – Anton Sanzay, Domaine de la Bonnelière (Bonneau Frères) and Rocheville (Agnès et Philippe Porché). There was a interesting variation in picking times. Both Antoine Sanzay and Rocheville had finished – Antoine on Tuesday evening while Rocheville were right at the very end of picking. 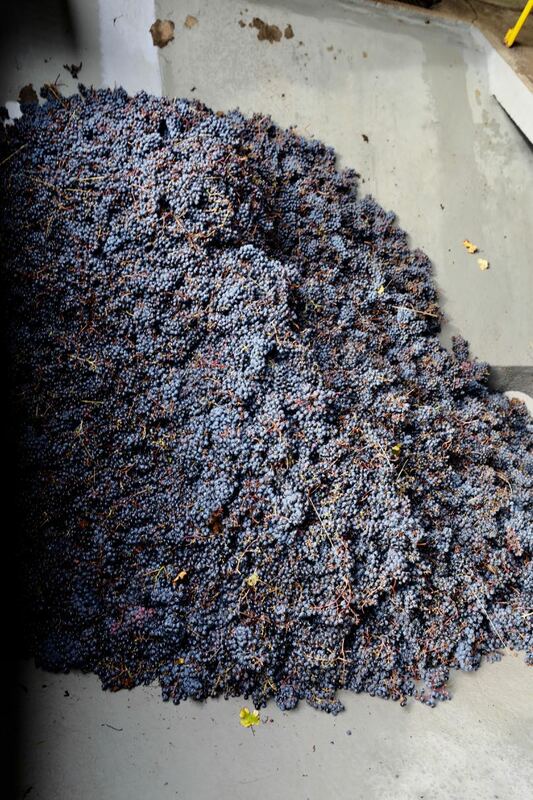 In contrast the Bonneau brothers were barely halfway through their harvest. 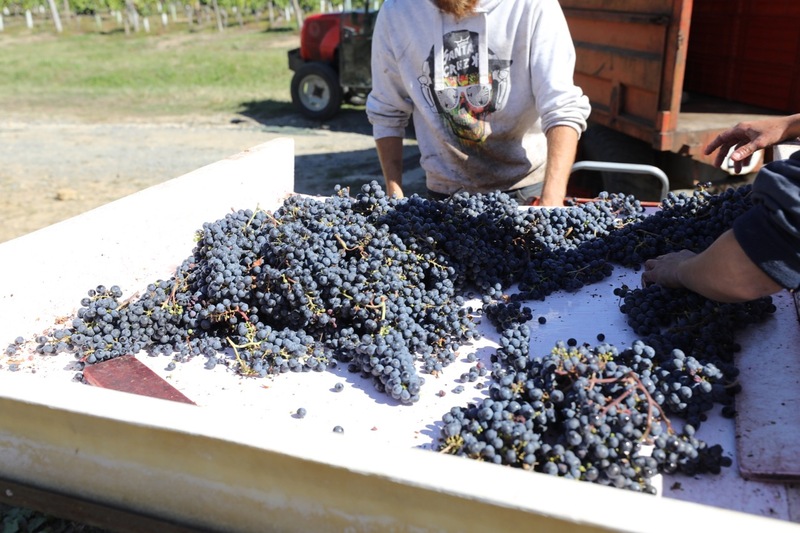 Cédric Bonneau explained that they had started the reds a week ago and that the tannins in the skins and pips remained strong, so they were taking their time with still a week's picking ahead. They still had all the vineyards on the coteaux (clay-limestone) to harvest. All three were understandably very happy with how clean the fruit is this year with virtually no sign of rot. 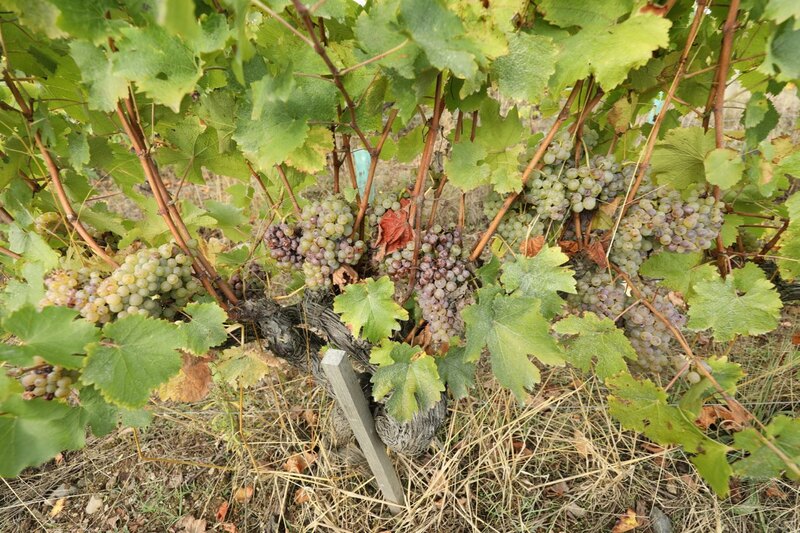 Serious losses from mildew has been a problem in parts of the Loire. 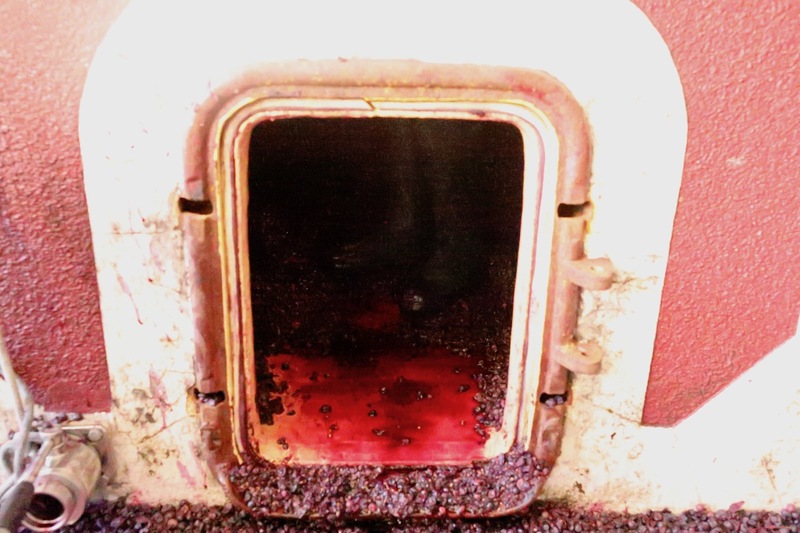 None of these three domaines had suffered from serious losses. 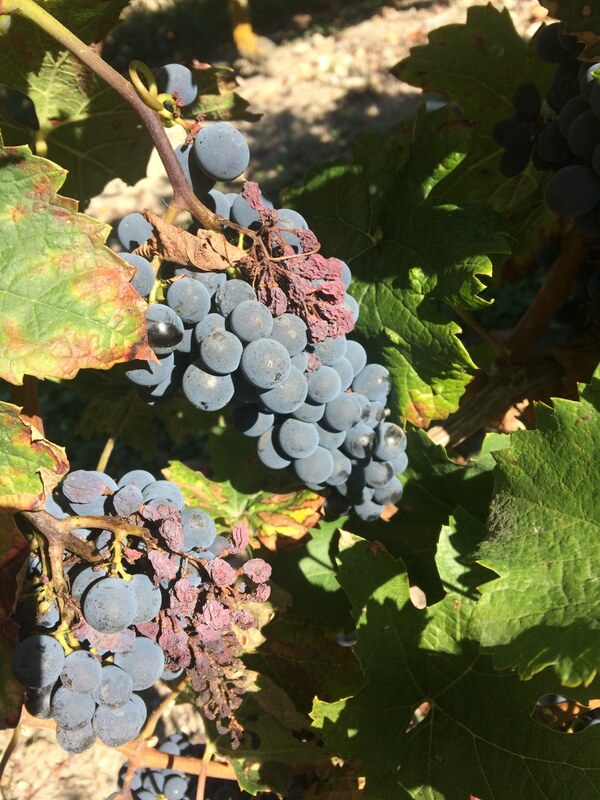 As elsewhere a limited amount of mildew damage was quite useful as 2018 was potentially a very big crop losing some grapes through mildew meant that a green harvest wasn't necessary. Driving through the Saumur-Champigny vineyards it was apparent that there was still a substantial amount of grapes to be picked. 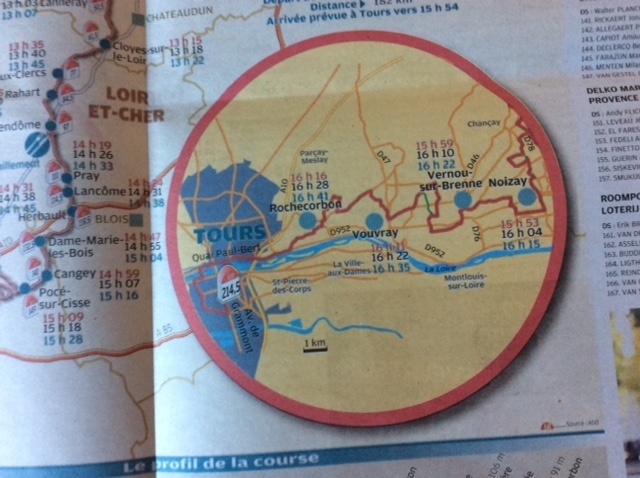 Doubtless inspired by the Vouvray articles on our blog (Les 5 du Vin), the organisers of the Paris-Tours classic bike race changed this year's edition run last Sunday (7th October) from the traditional route. 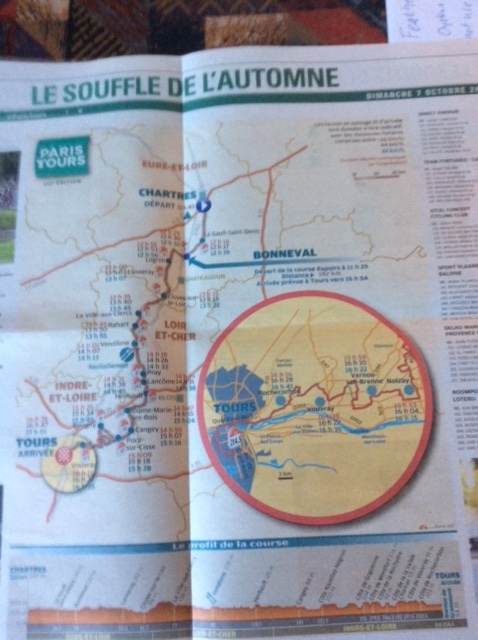 Instead of featuring some steep hills and narrow roads to the south of Tours, farm tracks and short steep hills in the Vouvray were featured in the last part of the race. The 2018 edition was won by Søren Kragh Andersen, who broke away from his two breakaway companions with 10 kilometres remaining to win on his own. The race is often known as a sprinters' classic. Over recent years wins have been shared between sprinters and breakaway specialists. If the change to farm tracks and short steep climbs is continued then it is very unlikely that Paris-Tours will ever come down to a big bunch sprint again as the farm tracks rapidly blew the race apart with numerous punctures caused by sharp stones. The new route made great TV watching but caused a mixed reaction amongst the riders and their team managers – some loved it while others said that farm tracks have no place in road racing. Paris-Tours was first run in 1896 making it one of the oldest bike races in the world. 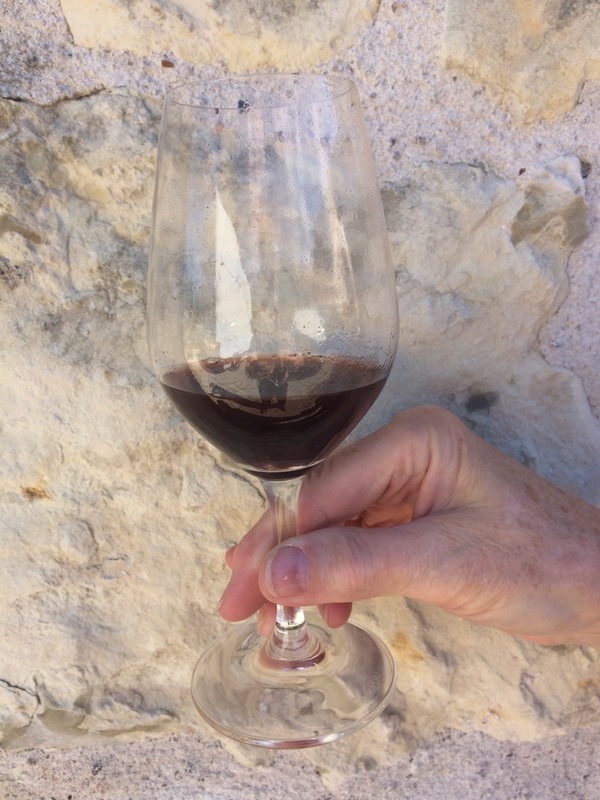 A glass of Bourgueil from Lamé-Delisle-Boucard – which vintage please? Voici une petite sélection des images du Répas des Aînes à Epeigné-les-Bois, le samedi le 6 octobre. Tous les photos que j'ai pris sont maintenant disponible a la Mairie d'Epeigné-les-Bois. 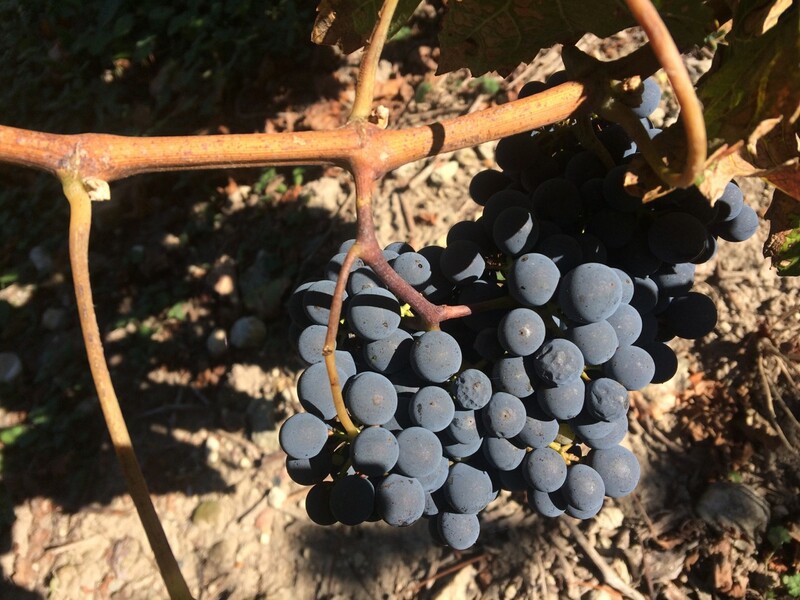 Last Tuesday we took a day-trip across from the Cher Valley to see how the 2018 vintage is shaping up in Bourgueil, Chinon and Saint-Nicolas-de-Bourgueil. In general here it is the same as elsewhere throughout the Loire with producers marvelling at the quality of the grapes. 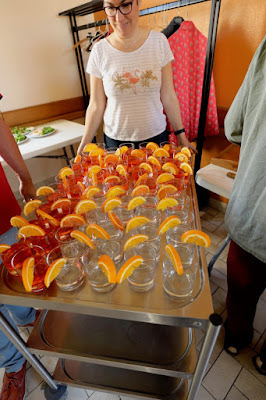 Since we arrived in the Loire on Wednesday 5th September there has been virtually no rain, apart from the odd storm when we were down in the Côte Roannaise, and on most days we have had sunshine and quite often high temperature – at times up to 30˚C. Now as we head into October it is cooler and some nights in Touraine are decidedly fresh. 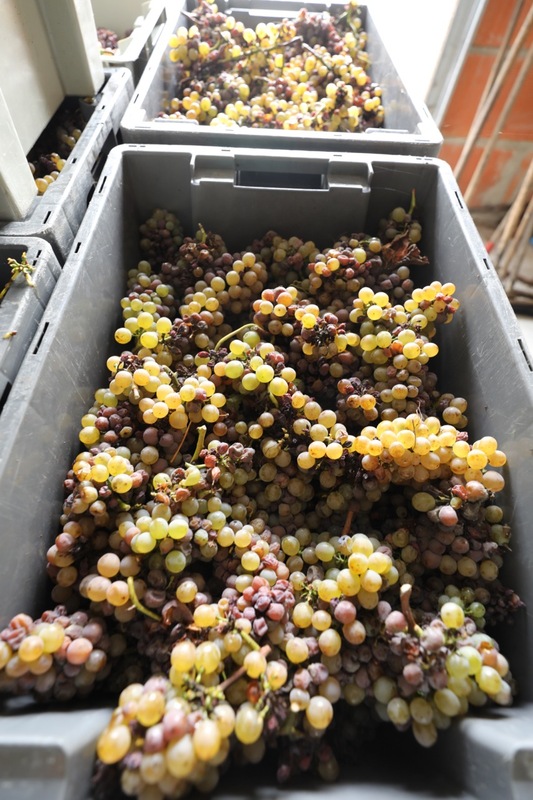 Last Tuesday picking in Bourgueil and, especially, Saint-Nicolas-de-Bourgueil was well underway, although the settled weather was allowing producers to wait for what they judged to be the best time to pick a particular parcel. Some producers were concerned about potential alcohol degrees rising too far – a risk increased by a drying east to north-east wind. 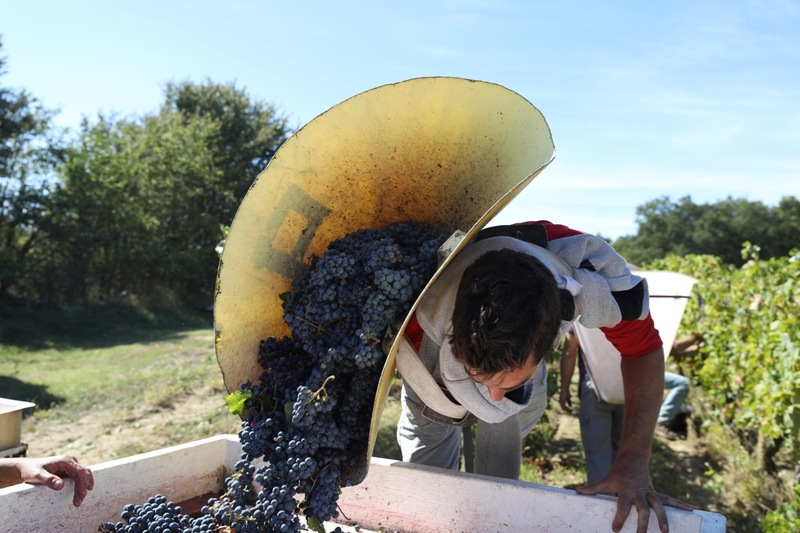 Picking in Chinon was less well advanced than in the other two Western Touraine appellations.